Face mist refreshes your skin.Face mist hydrates your skin on the go.Face mist helps you seal in extra moisture.Face mist primes your skin for makeup.Face mist helps blend your makeup.Face mist helps your makeup look more natural.Face mist sets your makeup. 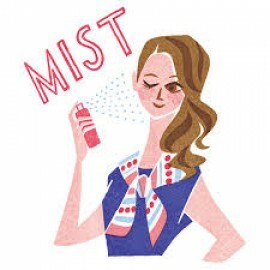 Face mist revives your makeup.Face mist can help control oil production.Face mist boosts absorption of your moisturizers and masks.Face mist helps dilute other products. Spray on face and neck and gently wipe a cotton ball or a soft cloth. Follow this routine every..
Vagad`s Khadi Mint Cucumber Face spray freshens up the face by removing dirt and Cleansing pores.it ..
100% PURE & NATURAL ROSE WATER gently hydrates, tones, refreshes and refines skin for a more ..
AMAZING ALL-NATURAL BENEFITS – InstaNatural’s Rose Water contains no chemicals, fillers or artifi..
Organic Face Toner Spray - Extra Nourishing & Hydrating Natural Facial Mist with Witch Hazel, Apple Cider Vinegar, Rose Water for Dry, Oily, Acne Prone Skin. Balance pH, Nourish & Moisturize 8oz.